Enjoy quick results due to innovative algorithms, superior accuracy with 5 point calibration features, and operate with full functionality with advanced communication & documentation feature. 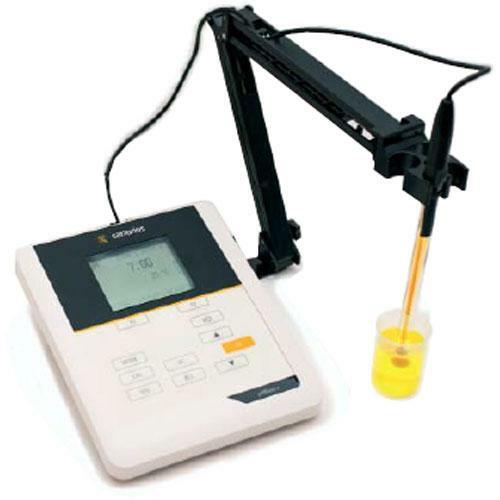 Direct data transmission through convenient USB PC interface allows data memory of up to 500 points to provide a convenient and easy way to manipulate pH results for analysis. The same great classic interface design, intuitive graphic icons, and indicators like ElectCheck and Stability Control round out this robust meter. Superior accuracy Up to 5-point calibration gives a broader range in slope accuracy. Complete functionality at your fingertips Fast and accurate results, easy operation, and capacity to have direct data recall and transfer. A complete pack for your entire pH requirements. Reliable and fast communication interface Transfer up to 500 data points using USB to computer interface with no adapters needed. Capture GLP time & date stamps and calibration record or print out quickly via USB (slave).